Okay, it's a little pretentious to put this under "Visual Art," but FWIW here's this year's jack o'lantern: an homage to the "Night on Bald Mountain" sequence from Fantasia. It was taken with an iPhone, which is not the greatest camera for close-ups in the dark. I'll try to get a better picture tonight. I carved Chernobog at the moment that the church bells start ringing, signaling the coming dawn and the start of the "Ave Maria." 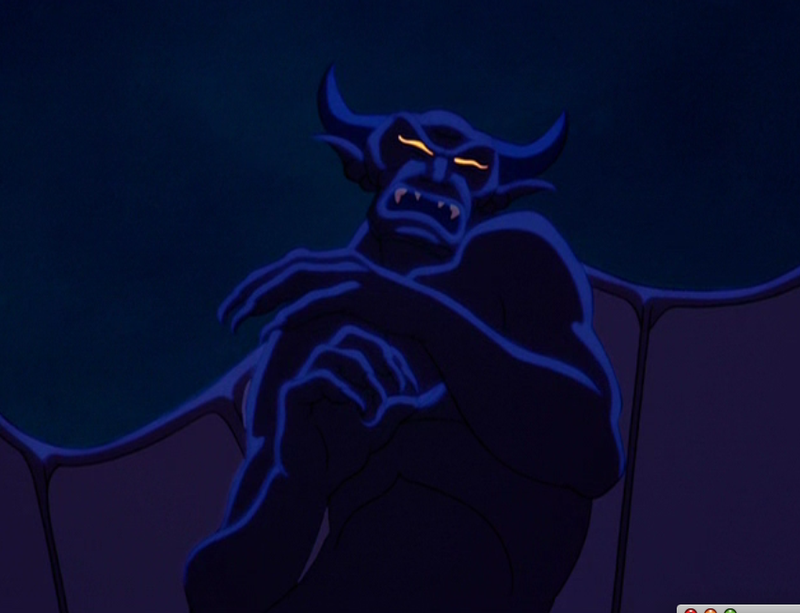 Chernobog is half-cringing from the holy sound of the bell and the white light that flashes when the bell rings. FWIW, here's the image I used for reference. 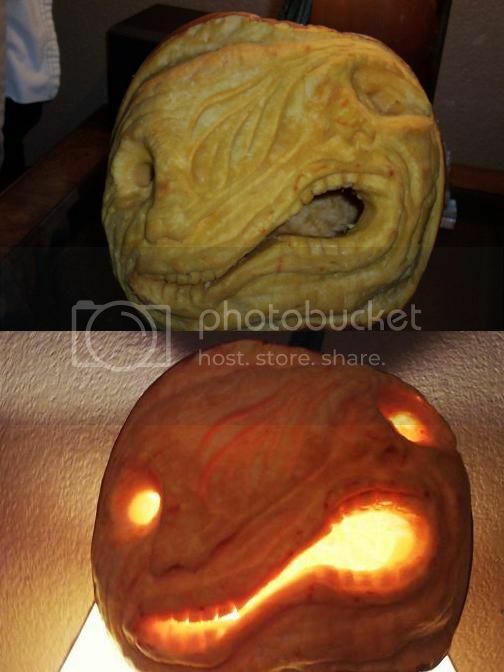 I learned a lot doing this year's jack o'lantern, and I think I could do it a lot better given a second shot. Last year I did Kiki from Kiki's Delivery Service, but I can't find an image from that one right now. I'll see if I can find it later. Below is a design I did about 11 years ago. 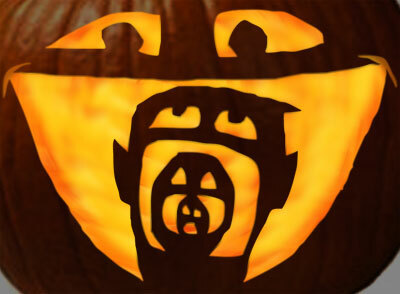 It is not actually a photo of my jack o'lantern, but a down-and-dirty Photoshop mockup made after the fact (since I can't find the photos of this one either). You will have to take my word for it that this is a pretty fair representation of what I actually carved. This one is called "The Hierarchy of Hell." It depicts four heads devouring one another, representing the depiction of infernal order of things depicted in The Screwtape Letters and similar sources. After carving "The Hierarchy of Hell," I discovered that my jack o'lantern had an unexpected but eerily fitting "performance art" aspect: As the pumpkin began to shrivel and decompose, the #2 head slowly began to withdraw into the maw of the largest head, while the mouth of the largest head slowly began to "close" on the other heads! By the time I finally went to throw the thing away, it had collapsed into a mouldering heap -- and when I went to pick it up, it fell apart completely -- and there on the ground where the base of the pumpkin had been was the clearly recognizable ruins of the three inner faces, long since fallen back against the floor of the pumpkin, grimacing up at me. I felt I had come a lot closer to portraying the reality of hell than I ever meant to! 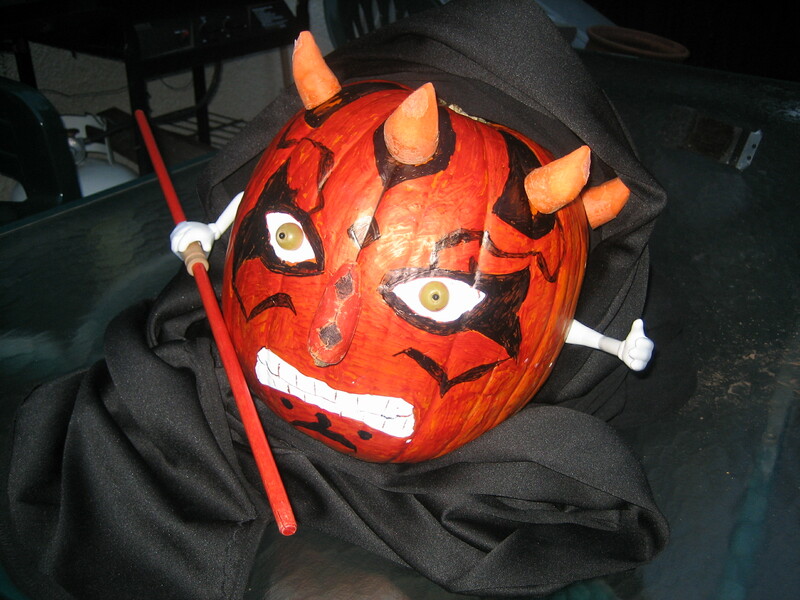 Finally, here's a jack o'lantern I decorated (as opposed to carving) five years ago for a company picnic. 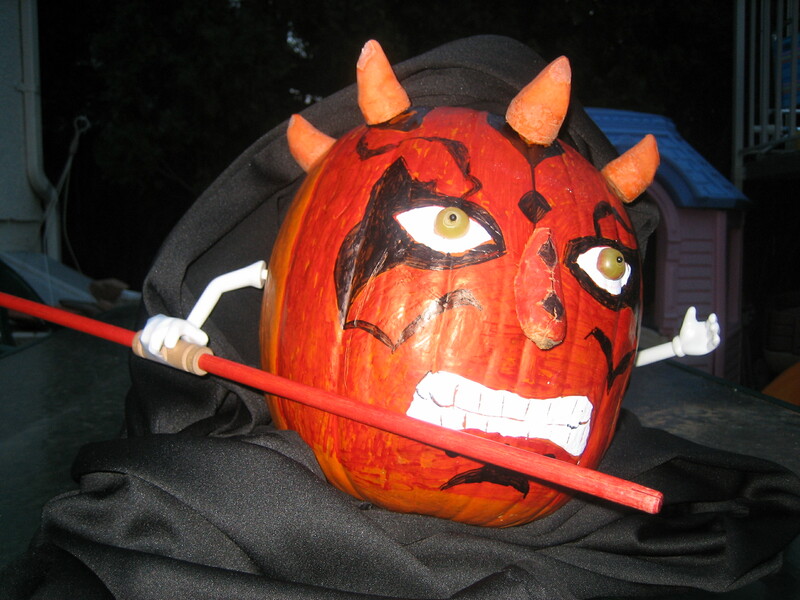 (Media notes: The horns and nose are hand-carved carrots, stuck on with toothpicks. Eyes are grapes, stuck on with pins (the pinheads are the irises). Facepaint by Sharpie & Wite-Out. Arms by Mr. Potato Head. Lightsaber by Tinker Toys. So .... I'm the only A&Fer who takes the whole autumnal personified gourd thing way too seriously? I would have joined in last year, but discovered the thread after we had tossed our pumpkins. I had a really nice Jack Skellington last year. The year before I did a Bruce Campbell "Ash" carving. I have two carvings in mind for this year, both kind of ambitious. We'll see what happens. I wanted to bump this up so that more could join in this year. I'll be selecting a few pumpkins this weekend, and doing my carvings the following weekend and posting pictures. Hope we get a few others to join in. Only had time for one today. An attempt at sculpting rather than carving. A fairly difficult task, but I think if I give myself more time I can improve. This is based on the Norwegian "split-face" creature from John Carpenter's The Thing. More to come later in the week. This Halloween I decided to go for efficiency and speed over artistic achievement. My 3-year-old daughter Catie requested a "scary ghost" for this year's jack-o'lantern, and I think I spent less than an hour creating this fellow. I think it's nicely evocative, but my favorite thing about it is that it didn't take me too long. That time of year again. These Jack o'lantern's (grown in a mold) are available at Wholefoods - for about a hundred bucks apiece. It's just plain cheating. And where is the fun in it? I think they're kind of cute, myself -- but can they really be "lanterns" if they don't have holes to let out the light? Did you two read the $100 a piece part? For a squash! Hey, I think all the JoL's presented so far are pretty darn cool. Not planning on spending $100 on any, but they look awesome. 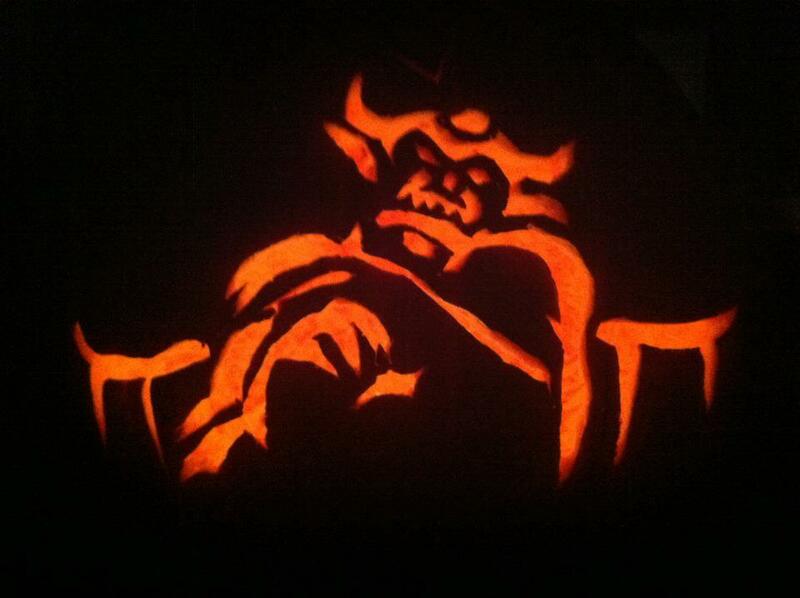 This year's jack-o-lantern, from the "Sorcerer's Apprentice" sequence from FANTASIA. The image is meant to show the moment that Mickey first attempts to stop the broom from carrying water. This is my second FANTASIA-themed jack-o-lantern, after the "Night on Bald Mountain" Chernabog image above. This year's Jack-o-lantern, "Jack O'rlock"